Think outside the gift box! Little presents for your best friends that are as unique as she is will make her special day! Whether she’s your very best friend or part of your girlfriend posse, when it’s a gift-giving occassion, it’s wonderful to come up with something special and unique to prove that you “get” her. Nice, too, when you can find a gift that’s fun, funky and affordable. Thanks to the internet, great gifts can be ordered online in minutes and sent to you to present at the party or shipped directly to the recipient. Here are a few ideas we love! For a woman who never goes anywhere without her cell, the ideal accessory for her constant companion is an embellished phone case. They’re bejewelled and bedazzled, protect the phone while looking very stylish and have the wow! factor. Also very cool, the iPhone printer. Just pop the phone into the slot and print off pictures and messages straight from the phone. Cute covers for iPads prevent scrapes and bumps with a little whimsy. Slip it on to make the device look like…an old-fashioned etch-a-sketch. 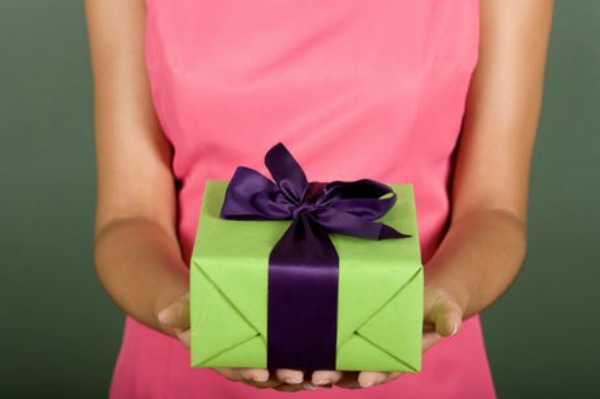 There’s nobody on earth exactly like her, so why should her gift be anything but unique? M&M Company, makers of the little chocolate candies, will print a personal message on M&M candy in the color of your choice. She’ll have fun handing them out…”Hi, I’m Annie!” or even a phone number or favourite quote. A big bag costs under $29 and makes a gift she won’t forget. Decide that she’ll have an excellent year via personalized fortune cookies. You determine what the fortunes will say, and the companies bake up a batch with nothing but good news for the birthday girl or bride-to-be. Boxed in a cute take-out carton, 1/2 dozen cookies cost around $24. Beautiful presentation makes hand-dipped plump strawberries a deliciously elegant gift. In white, dark and milk chocolate, the strawberries are large and the packaging makes them very special…it’s a luxurious, tasteful and tasty treat. Couture cupcakes are a yummy way to sample favorite cakes…red velvet, chocolate mousse, vanilla creme. There’s no shortage of specialty bakeries who will custome bake and ice these mini-masterpieces to resemble a frothy wedding cake or to follow a special party theme. Why settle for a plain birthday cake when you can present a scrumptuous sampling of everybody’s favourites! Present her with a pair of vintage fashion illustrations to hang in her massive walk-in closet! Padded and scented hangers are great, too… Just a whiff of sweet lavender or fresh linen scent freshens up her closet and the plush padding is kind to silk, satin and cashmere tops. We also love the custom canvas art many companies now make from a photograph. These transform a favorite picture into a painting: The texture of the canvas provides the magic that makes any photograph appear to be hand-painted art. Costs range from $72-$240 depending on canvas size. More whimsical and affordable are the $29 custom bubble-head dolls. Send in a photo and a bobble-head likeness is created to match the image. They’re silly enough to get the giggles going, and definitely one-of-a-kind.